We’re thrilled to welcome Colin Kirk-Potter and the launch of the Tamar Trail Runners and new running hub at the Tamar Trails Centre. 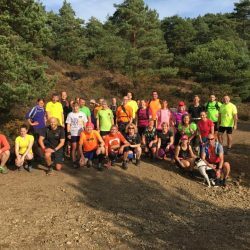 An experienced runner, Colin is offering twice weekly trail running sessions every Tuesday evening and Thursday morning. 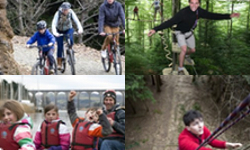 A great way to get fit and enjoy the Tamar Trails, the sessions also offer a good opportunity to socialise. All ages and abilities are welcome. Colin has now also opened the running hub retail outlet, selling running clothes, shoes and accessories for all your trail running needs. It started when I was at secondary school, and had the choice of getting a lift to the bus or staying in bed a little longer, saving 50p and running to school. Who’s been the most influential runner to you? What’s the biggest race you’ve tackled? I took part in the Alps Ultra Trail du Mont Blanc, which is 105 miles. I part walked, part ran that and it took me 30 hours. What’s your favourite race that you’ve taken part in? That would have to be the Dovedale Dash at home in Derbyshire. You can’t register until the day of the race and it’s just £5 to enter. It’s through the National Park and as many as 1,600 or so people take part. 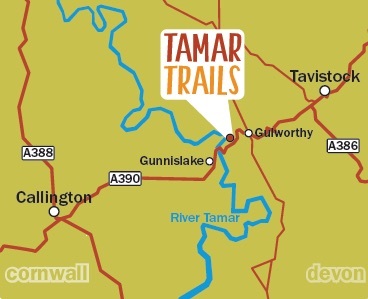 What inspired you to set up the Tamar Trail Runners? Having left the Services I was looking for the next challenge and decided to set up a running club as social enterprise. I was already offering a mobile shop for running gear and the Tamar Trails was the perfect environment to combine everything in one place. The running hub retail outlet completes the picture and makes for a more personal and social approach to the club. People can come, get fit and then hang around, browse in the shop and have a coffee and chat at the Beech Tree Café. I’m able to also offer training, workshops and talks. You also offer outdoor fitness classes, what’s the appeal of exercise in the fresh air? The benefits of outdoor exercise have been well documented in the media, with GPs being called on just a couple of weeks ago to prescribe green space exercise for overweight patients. It’s a great way to reconnect with nature. Benefits include the increased oxygen in fresh air, increased exposure to Vitamin D and increased sensory stimulation. The fitness classes are the perfect addition to running training, involving strengthening and conditioning. It’s like the gym only much more affordable (running club costs £1 per drop in session to just £15 for the whole year, fitness classes cost £3 per session). What’s the best thing about running at the Tamar Trails? The air is fresh, there’s loads of fascinating history to explore and the terrain is really varied with both short and longer route options. The best thing is that it’s all off road so you won’t see a single car. Further great news for local runners is that Parkrun will be launching its Saturday morning runs at the Tamar Trails starting on 29 October. This entry was posted in Uncategorized and tagged running, running events, Tamar Trails, Trails. Bookmark the permalink. Post a comment or leave a trackback: Trackback URL.